Well, I took yet another road trip this weekend. This time it was to Minnesota to bring my daughter back to the University of Minnesota. For the first hour and a half, we talked and talked. Sarah told me about her friends back home and her college friends too. It was a good chance to catch up with her in an environment where we wouldn't be interrupted. As the Santa Fe chugged along I also had a lot of time to think. One of the things I thought about was how much I love road trips. Donna and I both know people that "don't like road trips". We both find this hard to comprehend.What's not to like? The long hours sitting in the same position? The drone of the road? The traffic and near disasters? Part of this is caused by the fact that our marriage is built upon being in a place that is far from both of our families. My family is in Minnesota and hers is in New York state. This means we have to travel significant distances to see either or both of out families over the course of a year. Minnesota is a 5 hour drive and New York is 12 hours. We've both done each several times. It's part of who we are. Our trips have evolved over the years from young, in-love newlyweds, to young parents of small children (Lord, how did we do it?) to parents of teens who sleep most of the way for any trip. Because we travel so much, we've developed certain routines and activities that we do during the rides. I like to listen to my iPod and eat Twizzlers. Donna is a reader and, more recently a phone junkie - when there's a signal. The kids have evolved from sitting in car seats drinking from sippy cups and munching on goldfish, to listening to music, playing crazy YouTube videos and texting. They NEVER complain any more, and really haven't for many years. They know it's how we roll and they roll with it. Good kids with a travellin' bone. Of course we've had a few bad trips. A couple of them finished with one or the other of the kids SCREAMING at the top of their lungs for the last half hour. Those are fun. Winter travel has left us stranded a couple of times. The last time was in South Bend, Indiana when we had acceleration issues with our van to the point of being dangerous. We stayed a nearly sleepless night in a hotel that took pets (we had our dog, Toby with us), when Toby barked every time the elevator moved or people closed a door. Not our best trip. The thing I like best about road travel is the mindlessness of it all, Lots of long hours with nothing to do but think and zone out. Of course there's the anticipation of arriving at a place you really want to get to, but the long hours of down time is really nice. For me, there's lots of reminiscing and thinking and praying. It's a time when I work things out in my life. Road time is good time. You see some crazy things on the road too. We passed this vehicle today and were lucky enough to snap a shot. 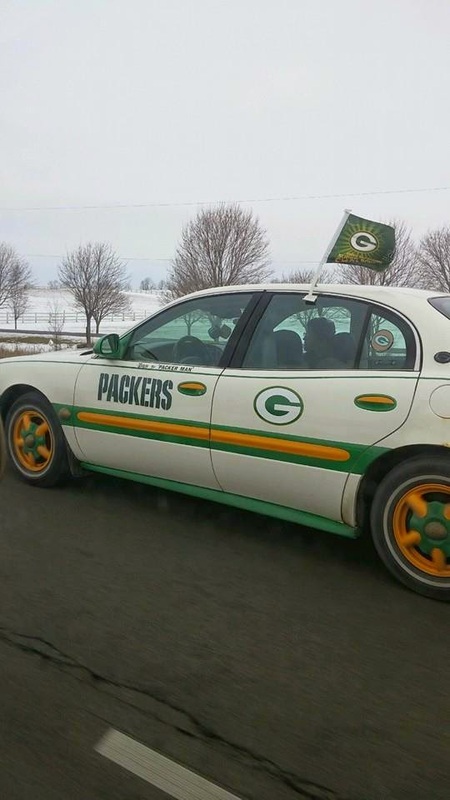 There's fans and there's fanatics. This would be the latter. And so, as we get older, I realize these trips won't last forever. There will come a time when we prefer to fly. But for now, I'd rather drive.